It is easier to advance in your career if you have someone in your corner. 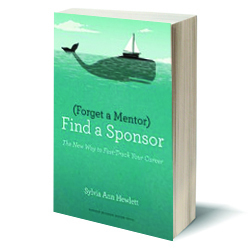 That’s the main argument of Sylvia Ann Hewlett’s book, “(Forget a Mentor) Find a Sponsor.” This book outlines why having a sponsor at work will help you in the long run. In a nutshell, sponsors are those who believe in your ability and are willing to vouch for you professionally. Sponsors act as mentors but go one step further — they assist their protégés in order to further both sides’ careers. Hewlett, the president of the Center for Talent Innovation, divides her book into three main parts. Part One is “The Sponsor Imperative” and explains what sponsors do and their relationships to their protégés. Part Two is the “Road Map for Protégés” and guides and advises an employee through finding a sponsor. Finally, Part Three is called “Pitfalls and Trip Wires” and warns employees of the possible problems that may accompany a sponsorship. Throughout the entire book, Hewlett provides personal stories, real-life examples from workplaces and an in-depth guide on sponsors. She does all of this with forthright, understandable language. This straightforward approach ensures that all her readers will learn something useful from her advice. This book successfully covers all the major areas of sponsorship. It is a helpful read for students who are looking to build successful professional relationships. However, before using this as a guide, you should keep in mind the difference between a sponsorship and a mentorship and should consider which relationship would be more beneficial to you in the long-run.